The other night, I finally got around listening to a few tracks on youtube and I have discovered that the second album from the album may not have been as bad as I have been led to think. True, “Baby Talks Dirty” is still the dirge I thought it was 33 years ago but some of the other tracks are ok, not great but ok. None of them really stick out for me however and what I find disappointing from the tracks I did listen to is there wasn’t one guitar solo from Berton Averre. One great thing about having a fabulous debut album is that it greatly affects the sales of the second album. In spite of all the negativity directed at “But the Little Girls Understand,” it still went platinum and peaked at number 15 in the charts. While I have to agree that it was a long way down from “Get the Knack” it’s not as bad as I first thought. Maybe I will listen to it one more time and see if anything sticks out. Next post: I am going to be away a lot for the next two weeks as I’m going on holiday. The first week, I’ll be in Torquay and no I won’t be staying at the Fawlty Towers and the second, I’ll be in Grimsby visiting the in laws. However, in between the trips, I will be going to Bloodstock and I can’t wait. If I can get on here before Bloodstock, the album I will cover will be “The River” by Bruce Springsteen.” If not, then in two weeks, you will get my account from Bloodstock. There’s no denying it, it is a fact that 1979 was the year for Blondie. They began the year with their 1978 release “Parallel Lines” which included the number 1 hit single “Heart of Glass.” One of the few songs to successfully make the rock-disco crossover that year. Debbie Harry became a common fixture on the walls of many teenage boys, including mine. Then they ended the year with “Eat to the Beat,” also a good album. Along with “Get the Knack” and “The Long Run” by the Eagles, this was also one of the albums that first greeted me when I came home on leave from that no contact with the outside world three month period I call boot camp. I won’t go into a compare/contrast with “Parallel Lines” the way I did with Fleetwood Mac’s “Tusk” album. “Eat to the Beat” took Blondie into a more new wave direction. The hard rock sound is still there but it seems more melodic this time around. 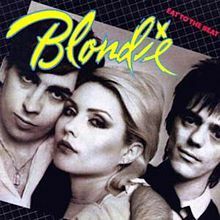 There are some very good tracks like the singles, “Dreaming” and “Atomic” and I really like “Accidents Never Happen.” It is a good album on its own and kept Blondie at the top of the rock music hill for 1979 and early 1980. “Eat to the Beat” was the second of two great albums from Blondie and the reason why 1979 was their year. Many boys like me first listened to them because they liked the lead singer, but stayed with them because of the music. It was something great to come home from boot camp to. I mentioned when I introduced 1979, that for three months of that life changing year, I was in a place where I was starved musically, Marine Corps Recruit Depot, Parris Island, South Carolina or to quote the film “Full Metal Jacket,” home for the crazy brave. When I left that lovely place as a US Marine, I came home on leave and found that the song of the day was “My Sharona” by The Knack. When I listened to it, I thought it was a lot better than all the disco that was around before I went to boot camp and so I bought the 45. A friend played the entire album for me not long after and I must say that I was impressed. “My Sharona” is by far the best song on the album and Berton Averre’s guitar solo on the song is very good indeed. It has always baffled me why he isn’t given more space to showcase his talents on other tracks on the album. That is not to say that the other tracks aren’t good, I especially like the second single “Good Girls Don’t” although I much prefer the lyrical version of the song not meant for radio and “Frustrated” is too a good song just because Averre plays a guitar solo on that one too. “Get the Knack” was one of the fastest selling debut albums since the debut from The Beatles in 1964. Many began comparing them to the legends from Liverpool and I think that was the big mistake. Okay, there were similarities, but I never thought The Knack were that good. Most of their songs were short sharp rockers that you got into then got out of. It was as simple as that. In past posts, I have spoken about the Sophmore jinx and I will be mentioning that again when I visit The Knack’s next album. 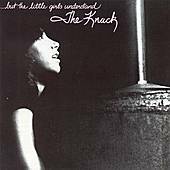 For debut albums, “Get the Knack” is one of the best. It’s a fun album that rides well on the back of a classic single and if there’s one good thing that can be said about it, it did knock disco off the charts.